Whether you’re wanting to celebrate in the heart of the CBD or closer to the MCG, check out our top picks of where to watch the AFL Grand Final in Melbourne and start planning how you’ll mark the biggest day in the code’s calendar! One of the city’s best known landmarks, Federation Square is transformed into a footy lover’s haven each and every year for the AFL Grand Final. Thousands of fans flock to the inner city square, where a big screen and live broadcast helps to ensure that none of the action is missed. A number of food trucks can be found on site, meaning that you won’t go hungry or thirsty during the day, while the lively atmosphere helps to make the experience one to remember. Don your team colours and spend a day out enjoying this Melburnian tradition. 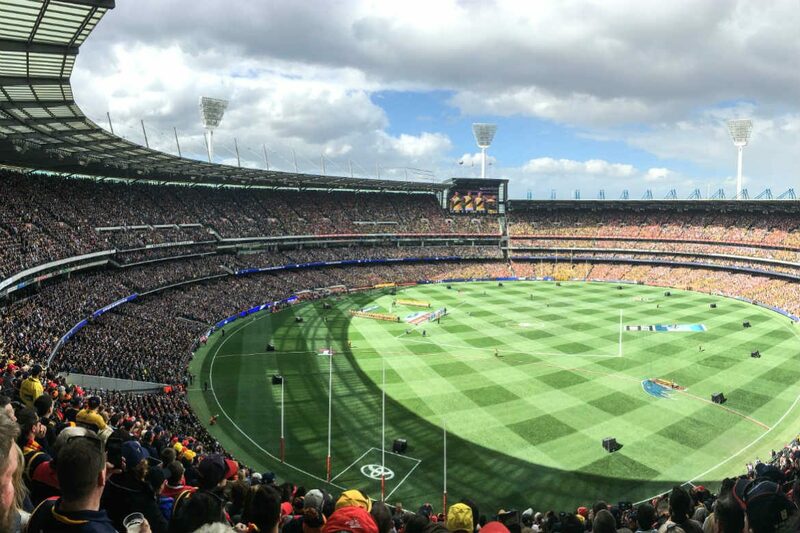 If you’re lucky enough to secure tickets to the big game, there’s nothing quite like watching the AFL Grand Final live at the MCG. Alongside 100,000 diehard fans, you’ll watch on as two of the code’s best teams battle it out for this year’s title. With a game day atmosphere that is vibrant, electric and nothing short of unforgettable, your ticket not only allows you to watch the thrilling grand final game, but also gives you the opportunity to catch live performances from renowned Australian and international musicians on the day. With previous years featuring appearances from The Killers, Ed Sheeran, Sting, Chris Isaak, Ellie Goulding and The Living End, you can guarantee that this year is sure to be a showstopper too. To celebrate the 2018 grand final, The St Kilda Branch will be offering up a $70 all-inclusive drinks package. From 12pm to 5pm, guests will enjoy entry to the venue and have the choice of house and sparkling wines, cider on tap, Carlton Draught and basic spirits. With all the action shown on a big projector screen and televisions throughout the venue, you won’t miss a minute of the biggest game of the year. After the final siren sounds, the celebrations will continue on into the evening, with live music and entertainment sowing the seeds for a great Saturday night out at this popular St Kilda venue. Gather your mates together and head to The Bridge Hotel in Richmond for game day. This year, for $100 you can enjoy the five hour food and drinks ‘Upstairs Package’, including local tap beer, house wine and roaming food. Kicking off at 12:30pm and running through to 5:30pm, the grand final package isn’t the only option at The Bridge Hotel, with the public bar offering free entry throughout the day. Every minute of the game will be shown across the big screen and all other screens throughout the upstairs and public bar areas, making it easy to catch every catch and kick. Woolshed Melbourne, one of Docklands’ waterside venues, is offering three different grand final packages to celebrate this year’s event. Helping to make the day special, guests can choose from the Super Box VIP Luncheon, the Mezzanine VIP package and standard general admission. General admission bookings are free, allowing you to secure a table ahead of time, while the other two packages are a little more indulgent. The Super Box VIP Luncheon is $150 per person and includes a 3 course lunch, half time snacks, a special appearance from an AFL player, tap beers, and sparkling, white and red wines, while the Mezzanine VIP package includes a visit from an AFL player, canapes, half time snacks, beer, and sparkling, white and red wines. Kicking off at midday, The Boatbuilders Yard will be celebrating AFL’s big day with handball competitions, drink deals and great food. Welcoming more than 800 footy fans in 2017, this year is sure to be bigger and better than ever, with a menu of footy-friendly meat pies, hot dogs, loaded tater tots and poutine, and $20 jugs of Carlton Draught on offer. As with previous years, the game will be shown on the outdoor mega screen and on five other screens throughout the waterside venue. After the premiership winners are declared, the festivities are set to continue, with a DJ playing tunes well into the night. To celebrate the 2018 grand final, the College Lawn Hotel in Prahran will be showing the game across 18 screens and two projectors scattered throughout the venue, meaning that you won’t miss a moment of the captivating tussle towards the premiership title. From the final siren to close, a live DJ will be also be spinning some tunes on site, helping you to celebrate well into the night. With an extensive food and drinks menu, an afternoon at the College Lawn Hotel is a great way to mark one of the most important days in the Victorian sporting calendar. Start the day off right with a hearty pre-game breakfast at Cremorne’s Richmond Club Hotel. With $80 a head getting you drinks and a meal that they’re describing as ‘epic’, it’s the perfect opportunity to get together with some friends and enjoy a great bite to eat before you head on to the MCG or continue your game day celebrations. If you’re hoping for a later start on grand final day, the venue is also set to take lunch and dinner bookings, so you won’t miss out on a seat, with a limited menu available. Just a short stroll from Federation Square, Flinders Street Station and Melbourne Town Hall, the Duke of Wellington Hotel, known affectionately as The Duke, is a great option if you’re looking to celebrate the grand final in the heart of the city. Come game day, the hotel will be showing the match live across all its screens, meaning that there are plenty of great spots throughout the venue to catch all the action as it happens. Gather together some friends, grab a bite to eat, enjoy a few drinks, and make the most of what is sure to be an unmissable game. Want to celebrate the AFL Grand Final in Melbourne? Book your flights, hotels, hire cars, and more with Webjet today! Feature Image Credit: Flickerd / CC by SA 4.0. Webjet is Australia and New Zealand's leading online travel agency. We enable our customers to compare, combine and book the best domestic and international travel flight deals, hotel accommodation, holiday package deals, travel insurance and car hire worldwide. © 2017 Webjet Limited - All Rights Reserved.